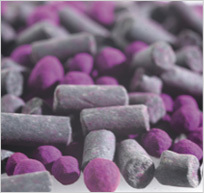 ARTGAS-SORB® purified the air trough the action of its components based on permanganate and alumina and activated carbon. ARTGAS-SORB® demonstrate a higher working capacity for broad-spectrum oxidation of contaminants in actual field conditions where multiple gas challenges are present. The ARTGAS-SORB® has been specially engineered to contain more permanganate (the active ingredient) for increased removal capacity, allowing the media to remain more available for removal of target gases. The objects can be placed in sealed spaces, such as display cases or storage containers with ARTGAS-SORB® and any gas problems are solved by passively absorbtion. The major acid pollutants—sulfur dioxide (SO2) and nitrogen dioxide (NO2). Reaction products of sulfur dioxide and nitrogen dioxide in the atmosphere and on surfaces include sulfuric acid (H2SO4) and nitric acid (HNO3), which may contribute to the degradation of paper and metals.